You can tell when Nick Warren’s on the decks. The music emanating from the DJ booth is that perfect club mix of driving percussion and soaring musicality, bursting out of the speakers, soaking everyone in melody, drenching them in sound. 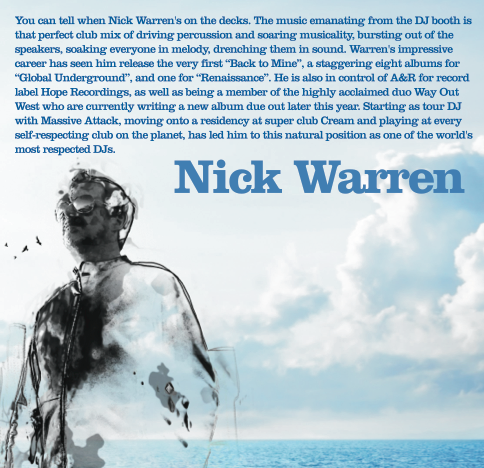 Warren’s impressive career has seen him release the very first “Back to Mine”, a staggering eight albums for “Global Underground”, and one for “Renaissance”. He is also in control of A&R for record label Hope Recordings, as well as being a member of the highly acclaimed duo Way Out West who are currently writing a new album due out later this year. Starting as tour DJ with Massive Attack, moving onto a residency at super club Cream and playing at every self-respecting club on the planet, has led him to this natural position as one of the world’s most respected DJs. For some music is their escape. 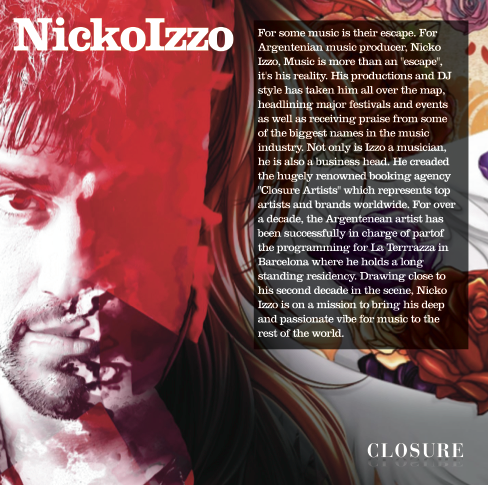 For Argentenian music producer, Nicko Izzo, Music is more than an “escape”, it’s his reality. His productions and DJ style has taken him all over the map, headlining major festivals and events as well as receiving praise from some of the biggest names in the music industry. Not only is Izzo a musician, he is also a business head. He creaded the hugely renowned booking agency “Closure Artists” which represents top artists and brands worldwide. For over a decade, the Argentenean artist has been successfully in charge of partof the programming for La Terrrazza in Barcelona where he holds a long standing residency. Drawing close to his second decade in the scene, Nicko Izzo is on a mission to bring his deep and passionate vibe for music to the rest of the world.